Today was Day #5 of Chocolate and Holiday Spirits Theme Week. Humpty Dumpty sat on a wall, Humpty Dumpty had a great fall...Well, he wouldn't have survived long, even if the king's men had found him, because he was eaten. Nursery rhymes can be pretty grim, can't they. But, today's chocolate Humpty was definitely on the sweeter side. 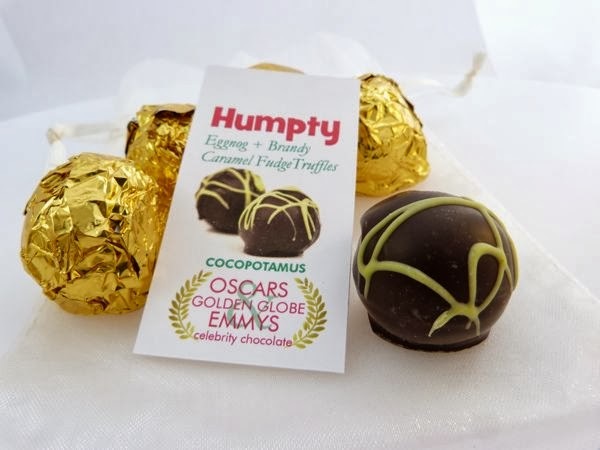 Today's "Humpty" Eggnog + Brandy Caramel Fudge Truffle was part of the Cocopotamus chocolate family from NYDC Chocolate (Albuquerque, NM), the creation of Max and Ally Sinclair. 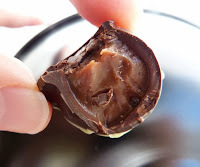 These gluten-free, fudge and caramel filled truffles, with brandy flavoring, were covered with chocolate and decorated with a light golden eggnog colored icing swirl. 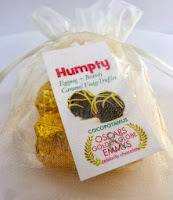 Individually wrapped in gold foil, five of these Humpty truffles were nestled inside a shiny mesh bag, tied with a slender white ribbon. As noted on the label, Cocopotamus truffles have also been included in celebrity gift bags at high-profile awards events: "Oscars, Golden Globe, Emmys." 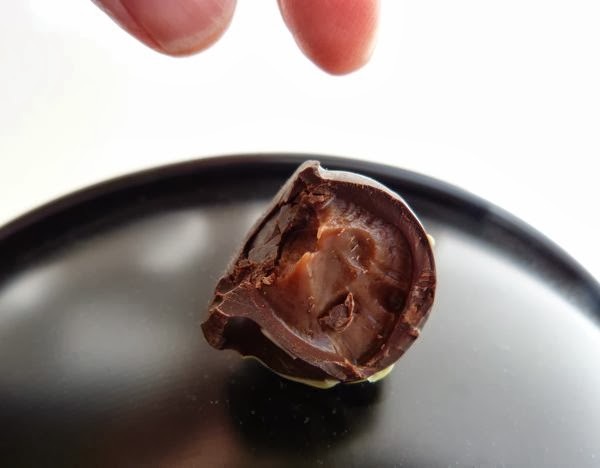 Packaged as they were, they made an attractive small gift.